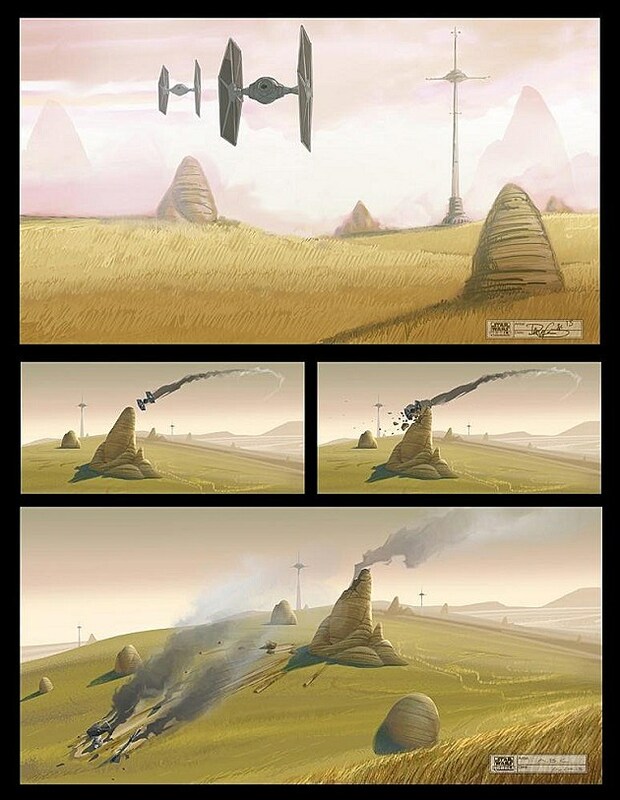 ‘Star Wars Rebels’ Releases First Concept Art and Official Details! It's been some months since the world-altering shocker that was Disney's purchase of the 'Star Wars' franchise, which preceded the announcement that Cartoon Network's excellent 'Star Wars: The Clone Wars' would shut down in favor of new Disney XD series 'Star Wars Rebels.' Today, coming out of Europe's Star Wars Celebration, we've got our first look at the artwork, logo, and new details of the series from executive producer Dave Filoni! Apart from the series' official logo, which borrows its striking orange colors from the Rebellion palette, the two pieces of artwork prevalently feature TIE fighters in their classic designs, harkening more toward the original trilogy and Ralph McQuarrie's classic artwork than the sleek variant designs of the prequels. We also get our first look at "The Ghost," the Millenium Falcon-esque ship the titular rebels call home. "We all like the sense in the classic films that the Millennium Falcon was a ship, but it was also a place, it was like a home," said supervising director Dave Filoni of the design. "We wanted to give this new generation of kids a place they could go feel safe when they were running from the Empire. And I'm really excited about that. We're on the run again. The Empire is controlling the whole galaxy, so we needed a home and a ship." For me, I wanted to develop a style different from 'Clone Wars.' This show is going to be different from 'Clone Wars'; it's intentionally going to look different. We're not proceeding with the same style. We wanted to give it its own look and feel. For me, that always goes back to Ralph McQuarrie, and that's a name you're going to hear over and over again. 'Star Wars' owes so much to Ralph, and I'm very dedicated to the history of Star Wars and of Lucasfilm. We need to maintain and respect that history but also do what made it great. It always leapt forward.